Record-breaking sailboats, highspeed ferries, dive boats, trawlers, sport-fishing boats, cruisers, and race boats, power cats, trimarans, and U.S. Coast Guard certified passenger vessels. Engineering services include rig analysis, multihull velocity prediction, structural design, CAD, ship motion studies, renderings/animation, weight and cost analysis. Web Site Snapshot: If available, above is a snapshot of the Morrelli & Melvin web site at http://www.morrellimelvin.com/ as it appeared when this site was added to the directory or last verified. 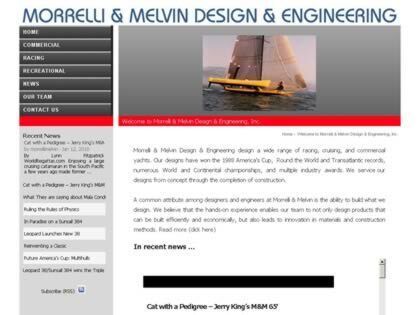 Please Note that Boat Design Net has no involvement with the above web site; all content and images depicted in the above thumbnail are the property and copyright of Morrelli & Melvin unless otherwise noted on that site. Description: Record-breaking sailboats, highspeed ferries, dive boats, trawlers, sport-fishing boats, cruisers, and race boats, power cats, trimarans, and U.S. Coast Guard certified passenger vessels. Engineering services include rig analysis, multihull velocity prediction, structural design, CAD, ship motion studies, renderings/animation, weight and cost analysis.